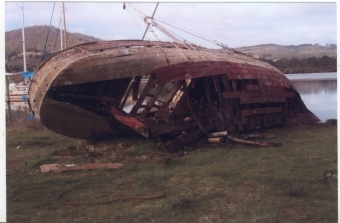 Many historical vessels are lying dilapidated in fields, sheds and on moorings around the state. The maritime museum is undertaking a project to document such vessels before they are lost forever, as well as other historically significant vessels. The data obtained from this project provides an invaluable resource for historians and those seeking to restore or recreate historic vessels. Surveying instruments are used to record a series of points on the surface of a vessels hull. From this information a 3-dimensional digital surface model of the vessel is created. The dinghy was built at Lovett's bay, Pittwater, NSW in 1924 of Australian Cedar.